It has been long time since I have not posted a new widget so here is a much awaited Facebook Slide Out Share button for Blogger blogs. Made with CSS3 and beautiful transitions. 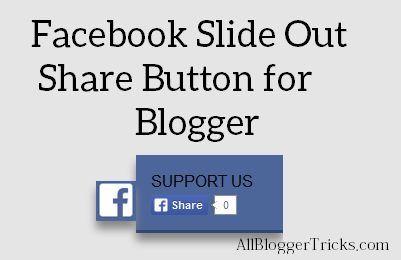 You can add this slide out share button to your blogger blog with the click of a button. To add this widget just click the below button and choose the blog in which you want to add this widget. Save the layout and you are done. The slide out share button will be on your blog and would be shown on all the post pages. You are done now. Now you and your visitors can see this awesome Facebook Share button on your blogger blog. Thanks for the information.Your killer contents was quite what to say..excellent.even i starts with blogging tricks sometimes will be blank out there. so any way keep posting killer contents. can you do this for twitter or g+? thanks for dropping this kind of articles... seems like a visitors locking contents everywhere here.. I am looking for this widget. Thank you very much for sharing. MSpy is very popular and compatible with all phones and operational systems. Its price is not high, <a href="http://celltrackingapps.com/spy-on-someones-facebook/>have a glance at</a> for more information!